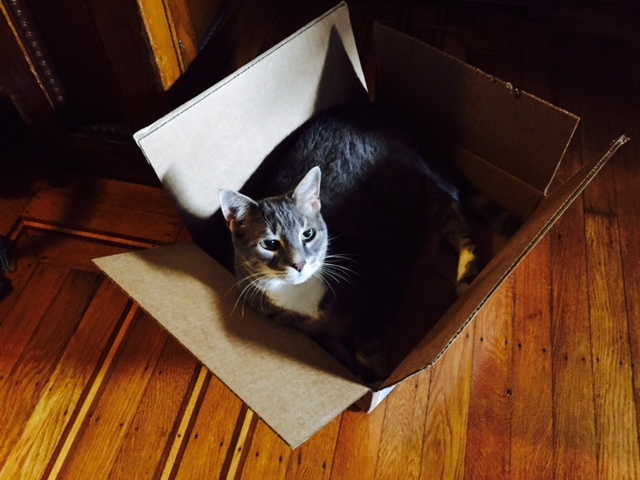 I bought a few books for my grandnieces and put the empty box on the floor. It didn't take long for our cat, Turtle, to claim it as her own. Cats will be cats! I like Ellery Queen. 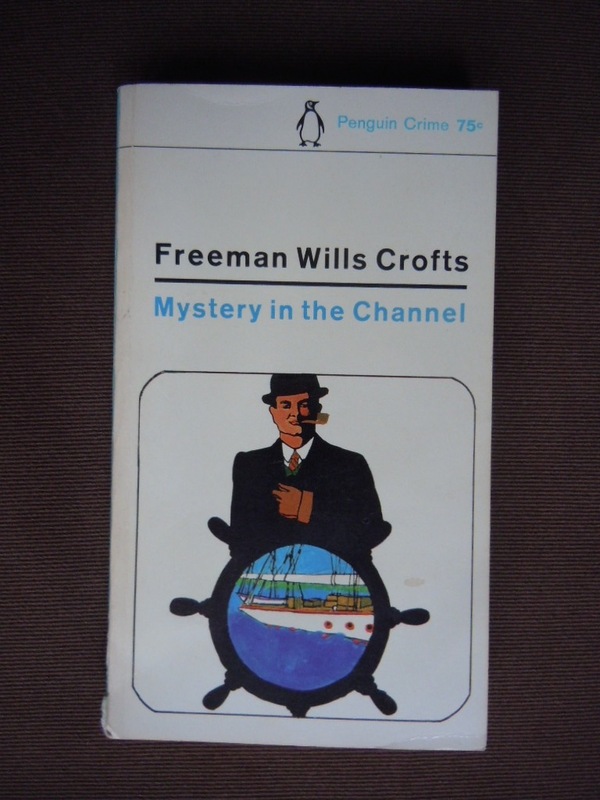 I love the TV series from the 1970s and I love the books it was based on. It's the whole stylish 1930s and 1940s that I love. Men wore hats and suits and women wore hats and, well, always looked more pulled together than we do today. Not that I want to wear those styles, but they just look so great. 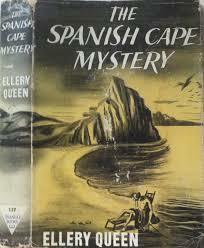 The Spanish Cape Mystery starts with Ellery and an older friend, a judge, heading off to the shore for a vacation. They arrive to find that the cottage they've rented has been broken into and there's an unconscious woman tied to a chair! She and her uncle were kidnapped, her uncle was spirited away on a motorboat, and she was left in the cottage. She is the daughter of a wealthy man who owns an estate on Spanish Cape, a promontory on the Atlantic coast. Back at the estate, a man has been murdered. Although the rest of the household and guests are shocked, none are sad. He had been staying there for months and no one liked him. So why was he there? That's part of the mystery. He was found completely naked except for a long cape. Ellery has to find the clues, put them together, and solve the mystery. As with, as far as I know, all Ellery Queen books and TV shows, the reader (or viewer) is challenged to solve the mystery before Ellery reveals the solution. I've just discovered that The Spanish Cape Mystery was a movie and is available on YouTube. You know what I'll be doing for the next two hours! P.S. Wow, was the movie ever different from the book! The motive was completely different, the murderer was the same, Spanish Cape was in California, some of the names were partially changed (Rosa Godfrey was Stella Godfrey, Paul Kummer was David Kummer), and there were more murders! 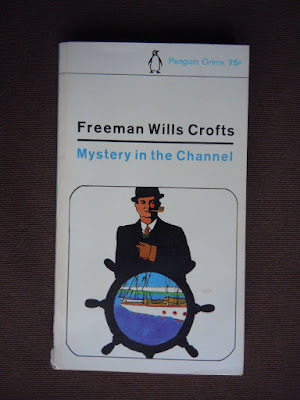 I've heard Freeman Wills Crofts is sometimes referred to as the 'railway timetable' mystery writer. It seems he had good cause to use timetables to solve his mysteries because he worked for the railroad for many years. This is the first of his mysteries I've read. Two men are found shot to death on a yacht drifting in the English Channel. At first, Inspector French believes it was a murder suicide. Mr. French, however, is not always correct. He changes his mind after the bodies are identified. Both were executives of a major business that was about to go belly up, leaving many investors destitute. Inspector French believes that the men were absconding with a great deal of the company's money, trying to get away before the crash. Two other executives are missing. Another employee of the company, the one who identified the bodies, helps French to figure out what happened. The beginning was interesting, as was the ending. The middle part of the book was less interesting. I've gotten lazy in my old age and the intricacies of who was where when seem too much to keep track of. I know I'll find out who did it in the end. This is another in the Sir Toby Glendower / Dr. Penny Spring series I recently discovered. I splurged and bought them all and I've been reading them in order. So far, I don't think that's necessary. Penny's friend in Boston, John Everett, is publishing a history of Mardi Gras by the head of a prominent New Orleans Creole family. Both John and the author have been receiving anonymous threats which have become increasingly more serious. John asks Toby and Penny to come investigate. Before they get there, John goes to New Orleans and wakes up in a hotel room with a murdered woman. 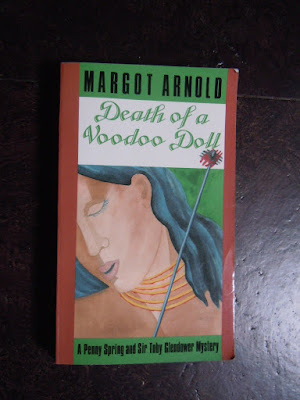 There is an air of voodoo about the murder, a symbol skewered to her breast. John's arrested for the murder and Toby and Penny must work to clear him. There are other murders, there is New Orleans jazz, there is a quick trip to Haiti, references to the Tonton Macoute and Papa Doc Dulavier, a general atmosphere of black magic, and tangled family ties. I enjoyed the story, but (see above) had trouble keeping all the members of the family and their ancestors straight. Focus, Joan, focus! Let's start with breakfast. We don't normally eat coffee cake or pastries for breakfast, but I like to have something special on Wednesdays to break up the week and on Saturdays, well, just because it's Saturday. 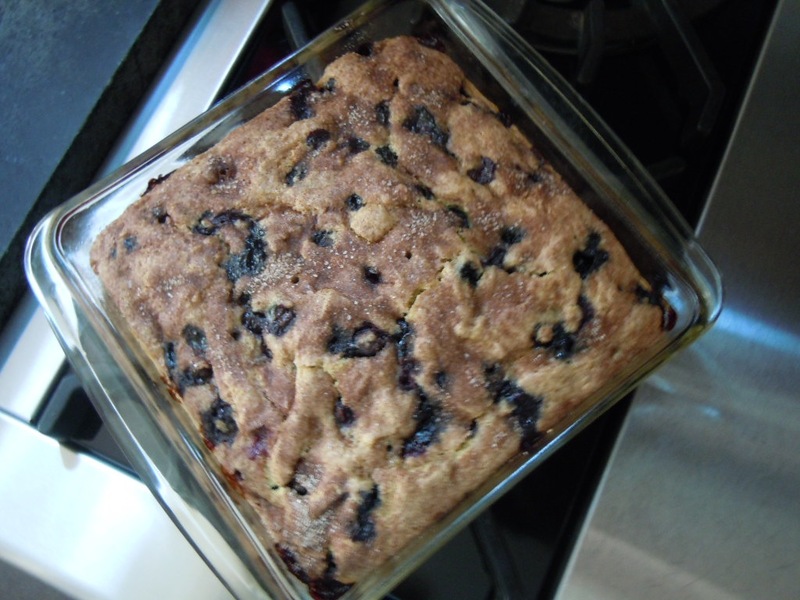 I often make muffins, but the coffee cake is easier. The recipe is from the old Betty Crocker cookbook, modified to be vegan (don't worry, no scary ingredients from other planets). It's easy to make. Heat oven to 375F. Grease round layer pan, 9 x 1 1/2 inches, or square pan, 8 x 8 x 2 or 9 x 9 x 2. Blend all ingredients except blueberries, beat vigorously for 1/2 minute. Stir in blueberries. Bake 45 to 50 minutes. The recipe calls for a streusel-type topping, but we don't like things too sweet. I sprinkle a little cinnamon sugar on the top before baking. But man and woman cannot live by coffee cake alone. Jack likes gazpacho and so do I. He's the great cook in our house and I'm the baker. I think baking is easier than cooking, so I'm happy to let him have the kitchen at dinner time. 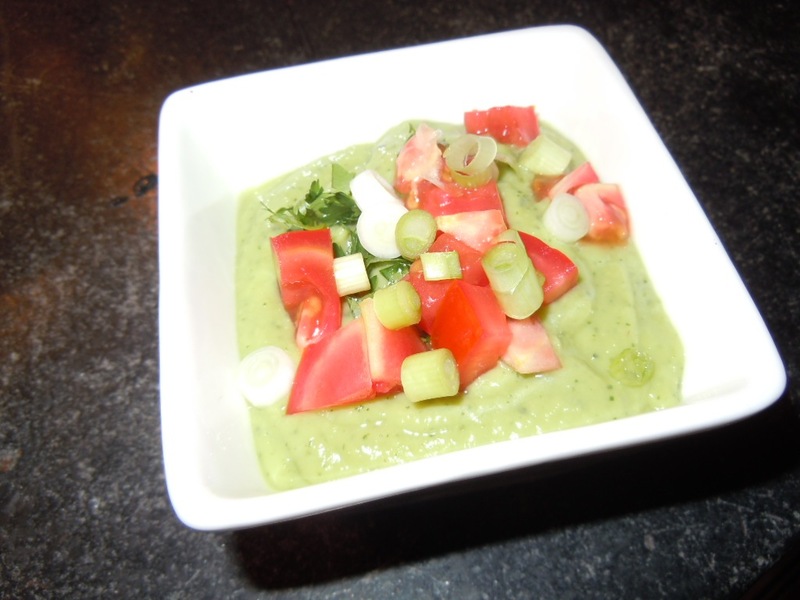 This avocado gazpacho is one of our favorites. Place all ingredients in blender or food processor and puree until smooth. Add more water if it's too thick. Flavor to taste and then chill. Serve with toppings: diced avocado, chopped green onions, diced fresh tomatoes, chopped fresh cilantro. This is a tasty and filling soup for a hot summer day. I feel very bad that I had to deface this book. It came to me in such hideous, unreadable condition, with smashed dead bugs inside and a frightening stain on the lower front corners that I had to trim those parts off and do my best removing the dead bugs. I almost threw it away, but I really wanted to read it. Sadly, it's also signed by the author. I'll take it to The Book Trader, but they'll probably just put it in their 'Free Books' box, if they don't just toss it. This book was recommended by another blogger. My library didn't have a copy, so I bought my used, very used, copy on line. I'm glad I pursued it. I loved it. 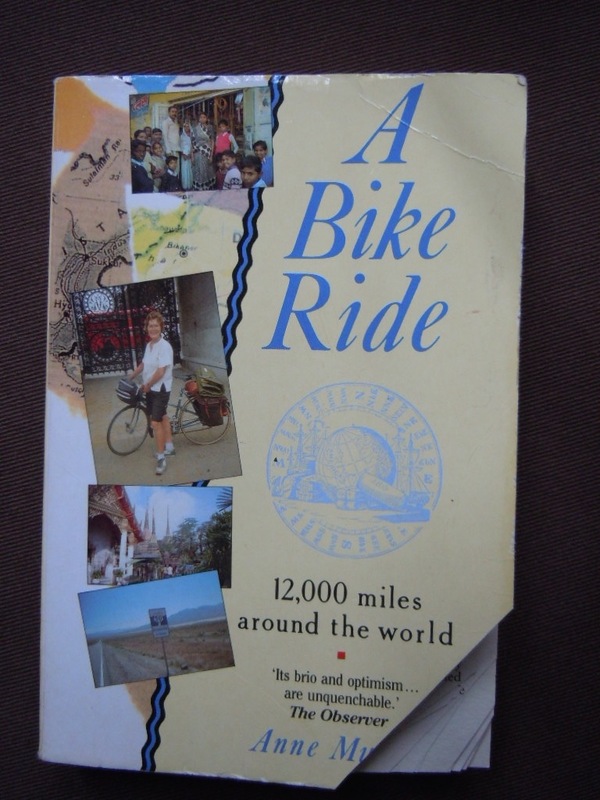 In her early to mid 50s, Anne Mustoe, a widowed, well-off, headmistress, decided she'd like to ride a bicycle around the world. She wasn't a cycler and wasn't in very good shape, but she took a few years to plan her route and, in the late 1980s, off she went. Alone. She'd been educated in the Classics, so she wanted to follow the old Roman roads when possible and then follow the trail of Alexander the Great into Turkey and Asia. Everything she needed, she carried with her in the panniers on her bike. Most of the people she met were admiring and amazed that she was travelling alone. Some told her she'd inspired them to do things they'd decided they were too old to do. Often, they would offer her a bed for the night, and she usually accepted. Biking gave her the opportunity to talk to people in small towns and villages that she never would have met had she been driving. Most of the people she met were friendly and kind. A few were not. She decides that the most generous people were the poorest. In a touching story, she tells of the very poor family who invited her to dinner, sharing their food with her, just a small spoonful for each. Her least favorite places seemed to be India and Missouri. She'd been used to fine bedding, good food and drink, and a rather posh life. But she soon adapts to less than ideal, less than clean sleeping conditions. For lots of reasons, I wouldn't have lasted on this trip. She begins to relish the freedom from possessions and the freedom that she has to go wherever and do whatever she wants. A few times, she's joined by friends for a week or two. She finishes her trip in London, where she started. She lost 23 pounds, rode 12,000 miles, and was gone for 439 days. For someone looking for a vicarious adventure, I'd recommend A Bike Ride. Sometimes when my reading gets stuck, I need a fast-paced, contemporary mystery to get me going. I've been stuck in two books that I've been reading for months. I want to finish them, but I want to read other books first. I read so many mysteries that I'm starting to feel like I'm on a diet of oreos (which are, in fact, vegan, so I could eat these overly sweet cookies until I'm sick and not compromise my ethics). Not that there's anything wrong with mysteries, or even a diet of mysteries. Lots of them are very well written. I like the excitement they provide. I like the danger without the risk. I need the bad guys to get theirs, unlike in life when many don't. 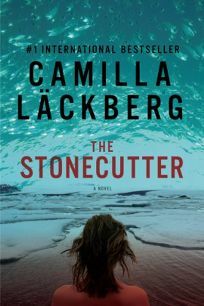 I read Camilla Lackberg's previous books, The Ice Princess and The Preacher, and had The Stonecutter on my Kindle. I also have The Stranger, the next book in the series. I'm glad because The Stonecutter ends with a cliffhanger to be resolved, I hope, in The Stranger. The Stonecutter weaves two stories together. Then there's a third story pretty much unrelated to the action in The Stonecutter. One thread is the back story of a one of the characters. The other story is the murder of a little girl, drowned, with traces of ash in her stomach and lungs. Detective Patrik Hedstrom must find the killer and figure out the significance of the ashes. To make it worse, the dead girl is the daughter of a friend of Patrik's girlfriend, Erica. He's seen the little girl, too, so seeing her body is a shock. He and Erica are having problems because they just had a baby. Erica is staying home with the baby and Patrik is having all the fun. Everyone needs to make adjustments. The dead girl's parents, Charlotte and Niclas, have been having problems, too. They've just moved in with Charlotte's mother, Lilian, and stepfather. The stepfather is very sick, confined to his bed. Lilian is self-centered but loves caring for her sick husband. She's not kind to her daughter, though, always criticizing her weight and the way she does everything. When their daughter is murdered, things get worse for everyone. There are so many suspects. Charlotte's mother and the next door neighbor have been carrying on a ridiculous feud. They seem to enjoy the fight. The next door neighbor has a son with Asperger's who spends days in his cabin in the back yard, writing programs for computer games. The next door neighbor also has a secret. Doesn't everyone? I can't say much more without giving away too much information. This was very enjoyable book. There's lots of action. It took me until just before the murderer was revealed to figure out who the culprit was. I'll be reading the next one in the series shortly.